If you’re a gun enthusiast and spends a lot of time shooting, you’ll quickly realize that it’s going to cost a lot of money to buy those bullets. But if you have the best progressive reloading presses you’ll be able to make ammo, saving you money and time. Reloading is popular among shooters and hunters as it’s affordable and practical to use. However, deciding what to buy can be difficult given the number of options available. I know how frustrating it can be to end up with a poorly made progressive reloading press. That is why I created this review so you’ll be able to create your ammunition. Aside from conducting these reviews, I have also included a buyer’s guide and general information about progressive reloading presses. All right, let’s take a close look at these 4 presses. I have included as much information as possible so you will know what’s in store for you. 3 What is a Progressive Reloading Press? 9 Who Makes the Best Progressive Reloading Presses? After reviewing the Lock n Load I can see why most Hornady reloading press reviews are good. It is packed with a lot of useful features such as the EZject System that ejects cartridges without fail. The Lock n Load is easy to use since it doesn’t need any adjustments. The rate is good for up to 600 rounds an hour so it’s not only simple to operate but makes you productive when making cartridges. The press comes with 5 auto indexing stations that simplify operations. 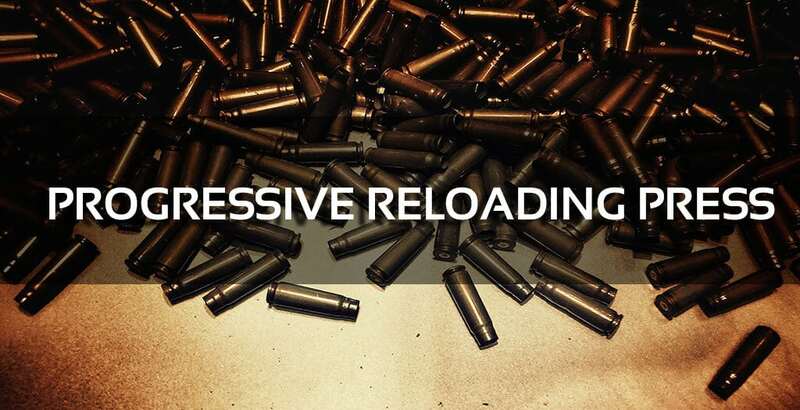 Reloading takes less time so you can do more and increase productivity. Replacing dies doesn’t take a lot of time as the changing mechanism was designed to accelerate the process. With other progressive reloading presses it takes a long time to replace calibers but here it takes less than 6 minutes. A collecting tray is built in that catches the cartridges you made. With this it’s easier to manage your ammo and keep your workspace tidy. The Lock n Load also has a case activated powder drop to manage gun powder. The Hornady Lock n Load progressive reloading press takes the drudgery out of making cartridges. It is powerful, switching dies is easy and the EZject works consistently. The Dillon XL 650 ACP ranks as one of the best progressive press for the money as it goes up to 800 rounds at hour. You also have the option to use the bullet and case feeders to further enhance performance. The ACP works for rifles and pistol calibers and both are simple to use. There are 5 stations with different functions, namely crimp, seat, powder check, powder drop and deprime / resize. The indexing system runs automatically to boost productivity. It is this feature that eliminates the need to manually adjust the shell plates. The ACP makes it easy to put the bullet in the cartridge as it just requires a single manual stroke. You don’t even have to tweak the dies as they’re already in place. One of the issues that new users may face is spilling, but that can be avoided if the press is handled properly. The Dillon ACP also cones with a toolhead and a loaded cartridge bin. Its primer warning system is very responsive as well. 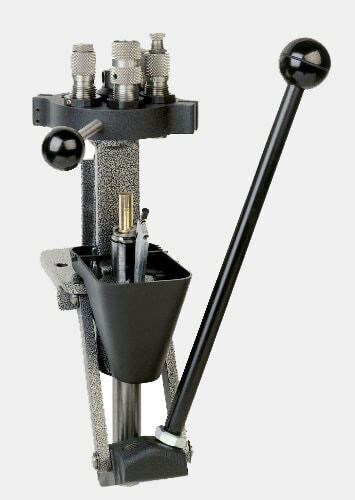 The Dillon XL 650 is a high end progressive reloading machine that matches the requirements of regular and advanced shooters. Its plethora of features boost productivity and the output is consistent. 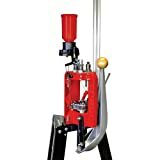 What is the best progressive reloading press? Well if you ask a lot of reloaders the answer will be the Load Master 45 as it combines ease of use with advanced features. Built to load 400 rounds an hour, the Lee Precision Load Master 45 is equipped with 5 stations that allows it to perform multiple tasks. The Load Master 45 frame is made from aluminum. This provides extra durability so it will last longer. The press works with all 7/8” to 14” dies, giving you greater flexibility. The Load Master Pro Auto Desk Measure provides assurance there won’t be any leaks or spills as powder is loaded. The Load Master dispenses the proper volume before each shell is crimped. There is an automatic indexing system so ammo quality is consistent each time out. You can detach the turret head for faster operation. This turret also makes it easy to replace calibers. Using this method the dies remain in place and doesn’t require any adjustments. The Lee Master 45 is an affordable reloading press that doesn’t compromise when it comes to performance. It’s also durable enough to be used daily without breaking down. The T-Mag Turret Press earns a spot here as it’s one of the best progressive reloader kit available. Lyman is best known for their gun accessories and this is one of the better ones they’ve produced. With half a dozen stations, the T Mag allows you to perform common reloading tasks at the same time. The unique design makes it ideal for use with handguns. One of the strengths of the T Mag is its removable turret. Using this feature you can quickly change the calibers without tinkering with the dies. The turret handle allows you to take out the turret head, and its design is suitable for right and left handed users. That they’re considerate of left and right handed people shows how versatile it is. The primer tray is plastic but it does the job. As long as you use the press properly it should run fine. The T Mag base is well-designed and makes it easy to attach to metal or wood. Made of solid iron, it is rustproof and lightweight. This makes it easy for you to set up the T Mag and get to work. The T-Mag Turret Press beats other manual presses when it comes to performance. It’s also stable, easy to mount and delivers consistent results. What is a Progressive Reloading Press? The best progressive loaders are pieces of equipment that enable you to build a gun cartridge from the ground up. What this machine does is combine gun powder, primer, casing and a bullet to produce ammunition. Progressive reloading presses are no longer as complicated as they used to be. They’ve become more powerful but at the same time more user friendly. Progressive reloading presses use different mechanisms to run, but the best ones churn out hundreds of bullets an hour. They may also have deburring and measuring functions to enhance the cartridge making process. You’re probably asking, why go to the trouble of making your own cartridge? Well there are a lot of good reasons to do so. Shooting can be an expensive hobby as bullet prices have gone up. With the best budget progressive press you’ll be able to make your own cartridges, choose the bullet, primer and powder without going over budget. A reloading press lets you customize the ammo to suit your budget and needs. If you want to shoot in a specific way, use a particular powder or primer, a reloading press produces the effect you want. 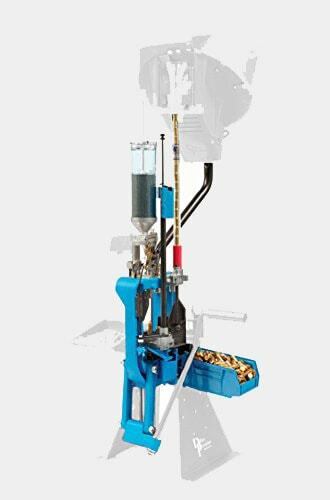 A reloading press allows you to use affordable bullets for tests, experiments and more frequent shooting. By getting a reloading press you’ll be able to use those old ammo rather than just throw them away. This is another good example of a reloading press saving you money. A reloading press may cost a bit when first purchased, but think of it as a good investment. The money you spend here will pay for itself as you will no longer need to buy new bullets whenever you practice shooting. 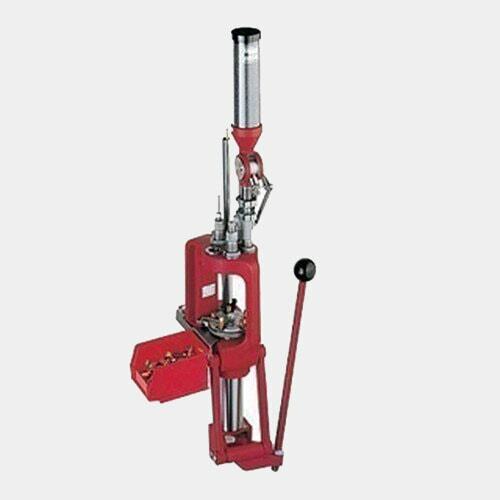 To know which is the best turret reloading press for you, some knowledge of the major types will be necessary. This is the easiest reloading press and suitable for beginners. Usually they can produce 100 ammo per hour. A single turret provides you with an opportunity to learn the essentials while still being easy to use. They also have few moving components so they’re no trouble to maintain. A turret press can work on one cartridge at a time and comes with 4 to 6 stations. These are suitable for beginners who want quicker results and faster caliber changes. A turret press has a greater production rate than the single and comes with a removable turret. Changing caliber is also easy and handles easily. It’s like having an ammo factory as the machine automates a lot of the work. Once you set up the dies it’s a breeze to switch calibers. Progressive reloading presses are more advanced than single and turret presses. They’re also adjustable, precise and need little maintenance. All three types have their own benefits. However if you want maximum value a progressive reloading press is best. If you’re serious about getting the top rated progressive reloading press, you have to consider several factors. A progressive reloading press is an investment, so make sure you buy from a reputable brand. Do not settle for a low quality press. Look for a reloading press that has a built mechanism that releases the finished cartridges easily. This ensures the finished product doesn’t get damaged when it’s released. Speed is measured in rounds per hour, and progressive presses are way faster than the single type. These are usually good for 400 to 800 rounds per hour or more. The more rounds the press gets done in an hour the better. However, this rate is most suited for heavy shooters. If you don’t reload that often you can probably settle for an entry level progressive reloading presses. Progressives have anywhere from 4 to 6 stations, and these are essential to make reloading more efficient. These stations allow the press to perform several tasks at the same time so you become more productive. These stations are designed for specific tasks. Station 1 may be for resizing, station 2 powder drop, stations 3 to assess the powder and so on. Check the number of stations and their specific functions. An effective and quick caliber changing system is necessary to boost productivity. The top progressive presses have unique built-in caliber changing systems that handle this. The press should have a mechanism that provides the right amount of gunpowder for a specific cartridge. The powder loading mechanism should also have anti spilling safeguards built in. Progressive reloading presses aren’t light but that’s to be expected. And a heavy weight isn’t all that bad as it brings about stability. A good reloading press is made from steel, high-quality aluminum or other durable components. 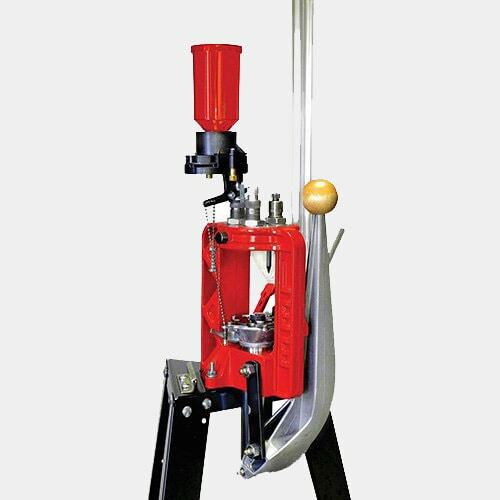 A solidly built reloading press is a must if you’re ye going to use it regularly. Also, get a reloading press that’s easy to set up. As progressive reloading press reviews have shown, these devices have different designs, so the following is a general guide only. Assemble the progressive reloading press and install the needed components. Refer to your owner’s manual for instructions. Put a fired case at the station 1 shell plate. Set the handle down so the case goes in the sizer die. Lift the handle and the case goes into station 2. A primer is sent to the priming station. Apply force to set the primer in the case. Use the press base adjustment screw to adjust the primer seating depth. Adjust the screw down until the primer is at the proper depth. Once the primer seating is set, put another fired case in the first station. Lower the handle and the case goes down. The shell goes down, the handle goes up and the case is indexed to station 2. next, seat the primer at the 2nd station. Put another case in station and lower the handle, allowing the case to go into the powder measure adaptor. Powder is poured in the case. The shell plate goes down and the case gets indexed to the next station. Take the case from the shell plate and set it on a scale to make sure that it is correct. After checking, put the case back to station 4. Put a fired case in station 1 and raise the level again. The case you put at station 4 goes into a die. The shell plate lowers the case and it gets indexed station 5. Adjust the eject spring case. The case eject has to be set as close to the shell plate as possible without making contact. Put a fire case in station 1. As the shell plate goes up, the station 5 case goes in the bullet seating die. Hold the bullet over the case and set it into the seater die. The shell plate goes down and the case goes into the eject tray. founded by Joyce Hornady in the late 1940s, Hornady has become synonymous with quality reloading products. Aside from progressive reloading presses, the company also manufactures case trimmers, bullet pullers, reloading benches and more. Lyman started back in the 1800s with the invention of a rifle sight. Since that product came out the company expanded operations to include a wide range of reloading gear including reloading presses. Lee Precision Equipment started with Richard Lee back in 1958 when he started making shotgun shells. From there Lee Precision grew rapidly and started to make various reloading equipment. The company traces its roots to founder Mike Dillon who wanted to progressively load a 223 o to an M16. He was told it wasn’t possible so he decided to modify dies and began selling load conversion kits, and the rest is history. Who Makes the Best Progressive Reloading Presses? I have spent a lot of time using reloading presses, some good and some not so good. Of the hundreds of brands available i can say that the brands mentioned above are the best at making these products. What i like about these companies is they make a wide range of reloading presses to suit your needs. Based on their products’ quality, you’ll be more productive and make more cartridges. Of the four products here, I believe the Dillon 50 ACP offers the most value for your money. Its round capacity is the best among the four and you can even add feeders to increase it further. The ACP is also one of the easiest to operate, offering a good balance between usability and power. Its stations are also well designed and speed up the cartridge making process without compromising performance. The ACP is also tops when it comes to automating a lot of tasks, making it an attractive option for beginners and advanced shooters. For these reasons, I can say with confidence the ACP is number 1 in my list of the best progressive reloading presses.